For travelers who really care about their vacations . . .
. . . where they go, where they stay, and their overall travel experience, from its inspiration and planning, to its bitter-sweet, do-I-have-to-go-home end. Candid reviews and recommendations you can trust for best-of-kind—usually boutique—luxury hotels, resorts, villas, cruises, and more. Special travel offers and deals, that will have you traveling—in style—for less. 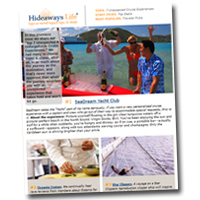 Your email is safe with us—Hideaways will never sell or rent your email address. Emails are usually sent about weekly, and you can always and easily unsubscribe.